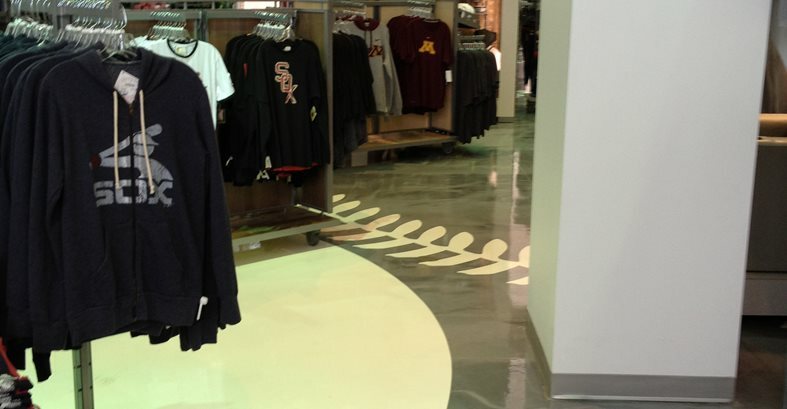 The stenciled floor of the Chicago Sports Depot, a White Sox retail store at U.S. Cellular Field in Chicago. Placing the fabric stencils of baseballs and baseball stitching were the most challenging portion of the job. The baseball stencils were carefully placed to line up with a matching design on the building’s exterior and glass windows. 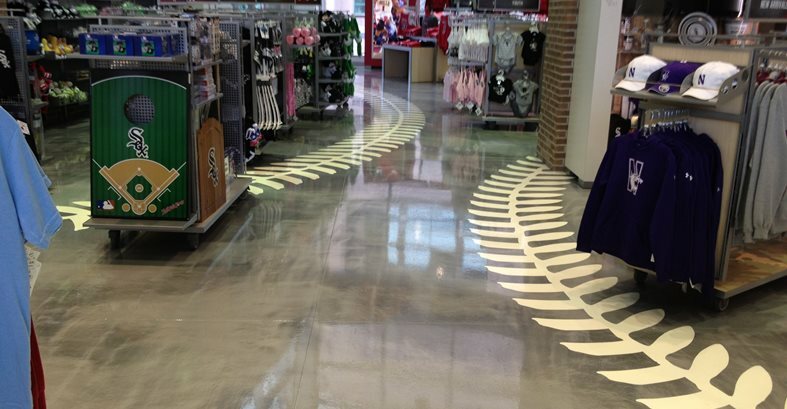 A metallic shimmer epoxy gives the floor depth and variation in color. The floor has a glass-like sheen that requires no waxing or buffing for maintenance. The stairs were finished the same as the floor. 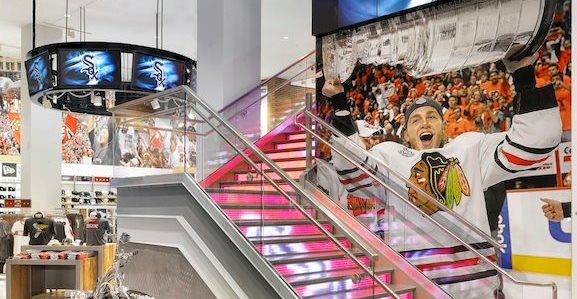 Lights installed in the risers of the stairs show images and flash in beat with the music in the store. The Chicago Sports Depot is a homerun for fans watching the games at U.S. Cellular Field in Chicago. 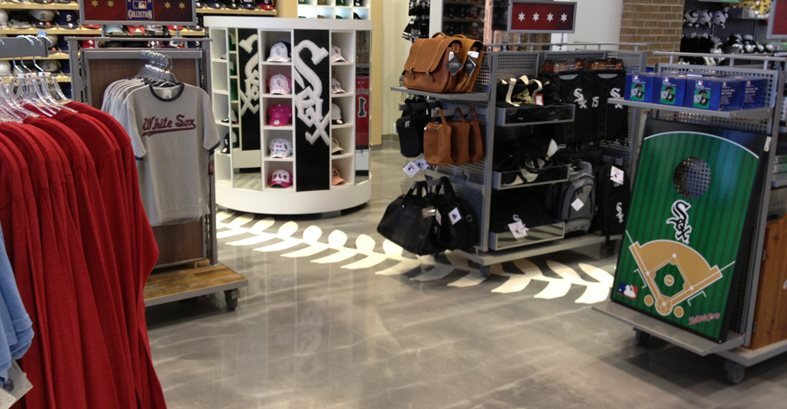 Complete with all the apparel and souvenirs a White Sox fan could dream of, the 12,000 square foot, two-story store also has a unique, baseball-themed concrete floor. 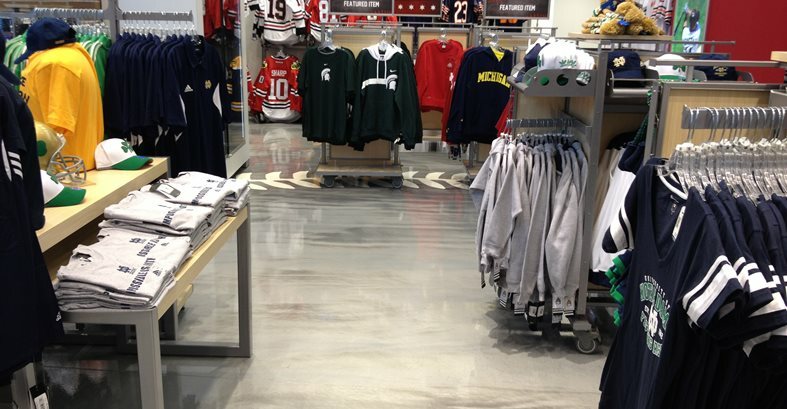 Using a metallic epoxy and unique stencil design, CCI Flooring in Chicago installed the flooring and helped carry the baseball tradition from the stadium into the store. “The architects and designer were intent on bringing the baseball theme inside to the overall design of the building,” says Mike Bauer, project manager at CCI Flooring. “There are stitching and baseball stencils outside of the building, on the stucco and on the windows, so the challenge was to continue that on the floor, he says. To achieve the design and create a durable surface, CCI’s crew first prepped the floor by shotblasting and edge grinding, and applying some joint filler. “We then had to lay down a moisture mitigation system, because our readings were showing there was heavy moisture in the concrete,” Bauer explains. A stencil in the shape of a baseball and stitching were then applied to the floor. “The stencils were really the most challenging part of the job,” recalls Bauer. “Once the second coat of shimmer had cured, we laid out the stencil. It was very time-consuming and had to be completely accurate in terms of where the blueprints showed the stencil should be placed. It needed to line up with the continuing baseball design outside and on the windows,” he says. The stencil was taped in place, and then a clear primer (a really thin coat of epoxy) was rolled over it. “The stencil is fabric with little holes in it so the epoxy works through it,” explains Bauer. “We rolled it over and worked it down to stick, then we pulled up the tape around the perimeter.” The next day, the stencil was re-taped and another clear coat of epoxy was applied. The tape was removed immediately, and finally a clear coat was placed over all of the floor. A urethane topcoat was the final coating applied to the entire floor. 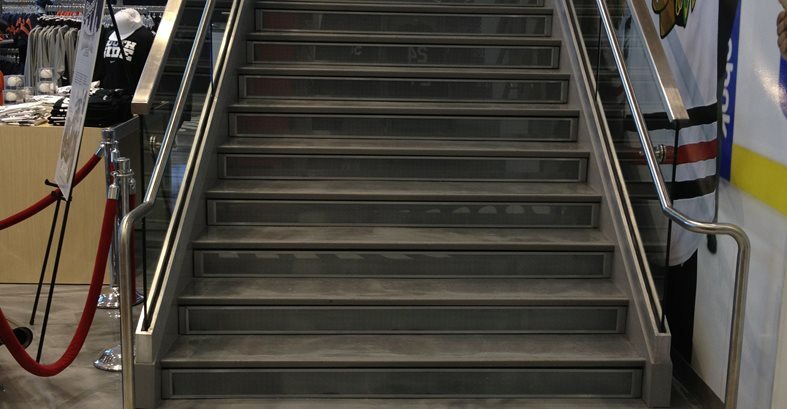 Another interesting part of the store included a set of stairs (30 steps in all) that were coated the same as the floor. “The stairs are really unique,” says Bauer. “We finished them just like the floor, but the electricians installed lights in each riser that can be programmed to flash with the beat of the music in the store. They also show images and spell out words, so if you’re standing in front of them at the right time, you might see them spell out ‘White Sox’ or something like that,” he says. For projects such as this one, CCI Flooring creates samples of floor surface finishes that allow the owner or architect to choose which finish they prefer. “On this project,” says Bauer, “they opted for a very smooth, glass-like finish from the 6-8 samples of textures we showed them. The floor is slick when wet, but no more so than terrazzo or tile.” Maintenance of the floor is minimal, which is an advantage for retail stores such as this one. There’s no buffing or waxing required. “It’s pretty standard maintenance of keeping the floor clean with a light wash of soap and water. The biggest thing is that the rocks and salts tracked in from the outside can scratch the surface. Other than that, we usually only recommend another coat of urethane possibly be reapplied every 10 years,” he says.